A Californian diocese has voted to become the first to break away from the US Episcopal Church in protest at its support for gays in the Church. Delegates of the San Joaquin diocese in Fresno voted 173-22 to secede. It follows years of disagreement with Church authorities triggered by the consecration of a gay bishop in 2003. The Episcopal Church is the US wing of the 77m-member Anglican Communion, which is threatened by a deep split between conservatives and liberals. The Episcopal Church says that in recent years 32 of its 7,600 congregations had left, with another 23 voting to leave but not taking the final step. San Joaquin is the first of the Church's 110 dioceses to complete the split. In a later vote, the diocese accepted an invitation to join the province of the Anglican Church of the Southern Cone of America. "This is the first time, I believe, that a diocese has finally said 'enough' in terms of the liberal theology of the Episcopal Church," said Bishop John-David Schofield of the San Joaquin diocese ahead of the vote. 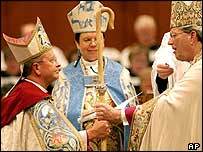 Anglican leaders in many parts of the world were angered by the consecration of openly-gay Gene Robinson as Bishop of New Hampshire in 2003. Conservative churchgoers believe active homosexuality is contrary to the Anglican Communion's teachings, which are rooted in the Bible. However, liberal Anglicans have argued that biblical teachings on justice and inclusion should take precedence.